I recently had reason to order from Old Glory Miniatures. This company has a very broad range of figures including Napoleonics. I had previously ordered some Austrian Grenzers, Spanish Infantry and some Austrian Hussars in the early stage of my figure painting career (about 5 years ago to be exact), I was not too impressed by the figures and got rid, and moved on to better things. They do, however, have a lot of miniatures that are not available from other manufacturers, especially in the equipment range. 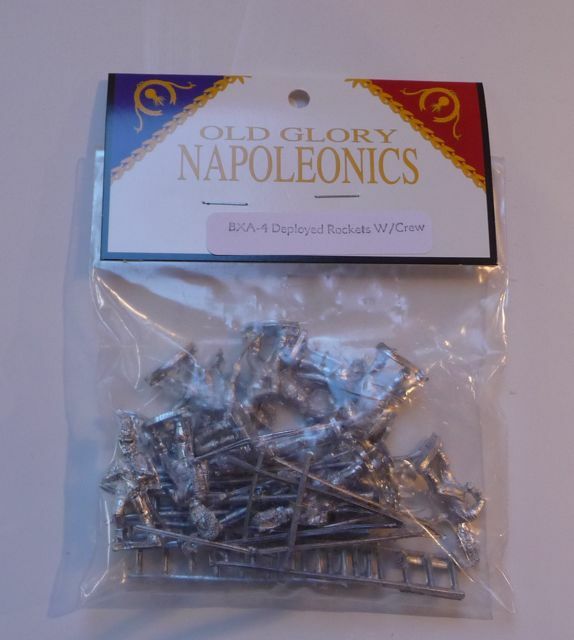 I was looking for some rockets and in 28mm they are it (someone of course will say Minifigs have them as well, but although they are nice they do not fit with other 25-28 mm ranges). Their website is easy to navigate, but there are a couple of problems. It was easy enough to find the British Rockets, and there is a nice picture, but I could find no indication of what was actually in the bag. It looked like there was 4 figures and 1x24pder and 1x6pder with 1 rocket so I ordered 2 packets. Lasalle recommends a 3 base unit for a Rocket Battery, I thought about ordering 3 packets, but I said to myself let's wait and see. I should also note that they do not take Paypal, but you can order online with a credit card. The order was made made on the 8th Jan, charged on the 11th and they arrived well packaged on the 15th which is within a week, not too bad. I did get a confirmatory email that they had received my order on the 8th, but no email to say they were dispatched. I also note that they charged $9 for postage and an extra $3 for packaging! Now the rate is $3.09 + delivery confirmation, so less then $4, I believe. I hate these hidden charges, add the cost of packaging to the item and charge what it actually costs to ship. The item was nicely packaged as you can see, but wow there appeared to be a bit more in the package than what I thought. I actually got 12 figures (4 poses) and 4 each of the 24pder launching apparatus, 24pd rockets, 6pder launching apparatus and 6pd rockets. This was quite a deal for $23. 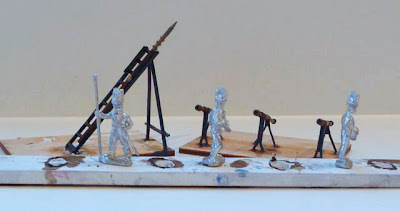 With this I can easily make 3 bases of the big rockets with 3 figures to the base and an extra base of the little rockets with another 3 figures (does anyone want to buy my extra packet)! The rockets themselves appear to be quite nice and they were not too much work to assemble. The figures, I believe, are not the best sculpts, but they are not as nasty as the Redoubt figures I have as my RHA. They are much more slender then my usual Front Rank etc, and also a little thinner than the Perry's, but they will fit in the army without problem. The flash was not too bad, we will just have to see how they paint up. You can see the equipment is done already. So what should I say; the figures and equipment are certainly well priced. I do have some reservations about the website, the mailing costs and the figures themselves, but certainly they will be happily received by me in my British Army. I will give them a 3 out of 4 rating. You should have ordered direct from the Old Glory 25s website instead of their middleman website. I know, it's confusing. The packing charge is odd. I never got charged that using the 25s website. I agree that it's a rip they also charged you $9 for two packs. I guess that is how their flat rate works--encourages you to order more. I must say I have had great service with their direct 25s website. My son has been prodding me into Napoleonics. I'm torn between 15mm and 25mm. I knew a guy who owned every pack of OG Naps. I just find them horrid. Their 2nd Gen is better. Perry and Front Frank seem great. Your blog is an inspiration for me.